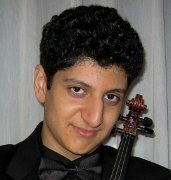 Prize-winning violinist Amir Safavi began his violin studies when he was five years old. A graduate of the Royal Conservatory of Music (ARCT), he received the Gold Medal for the highest mark on the Performance Examination in Canada. Amir has won numerous grand prizes and awards at the provincial and national levels, including the first award in the Strings Open (2008) and Diploma (2007) levels of the Provincial Finals Competition (OMFA), the ACNMP national award for the most promising performer of the festival, the Most Promising Performer award of the Toronto Kiwanis Music Festival, along with other best of festival awards throughout Canada. As well, he was selected as the Canadian representative for the 2009 ASTA National Solo Competition, held in the United States. Amir made his solo debut with the Koffler Chamber Orchestra, under the baton of Jacques Israelievitch, and has performed with several orchestras including the Toronto Sinfonietta, Academy Symphony Orchestra and Kitchener-Waterloo Chamber Orchestra, among others. This season, he will perform as soloist with the Guelph Symphony Orchestra, University of Toronto Hart House Orchestra, Cathedral Bluffs Symphony Orchestra and the Scarborough Philharmonic, as a result of winning their concerto competitions. Other upcoming performances include a solo recital at the Midday Music with Shigeru series in Barrie, Ontario. He has performed in many venues, including the Four Seasons Centre for the Performing Arts, George Weston Recital Hall, Glenn Gould Studio, Mississauga Living Arts Centre, and the River Run Centre. Amir has appeared frequently in the Soundstreams Canada- Young Artist Overture Concert Series, performing contemporary Canadian music and 20th century masterworks. A scholarship student at the Young Artists Performance Academy of the Glenn Gould School of Music, Amir serves as the Concertmaster of the Academy Symphony Orchestra and the Senior Strings Orchestra of the University of Toronto Schools. Amir has performed in several master classes for eminent artists such as Peter Oundjian, Andrés Cárdenes, Mauricio Fuks, Andrew Dawes, Victor Danchenko, and Mimi Zweig. In addition, he has been coached by artists such as Joaquin Valdepenas, Joel Quarrington, and Andrew Burashko. Amir is currently studying with renowned pedagogue Paul Kantor has studied privately with Jacques Israelievitch, former concertmaster of the Toronto Symphony Orchestra.